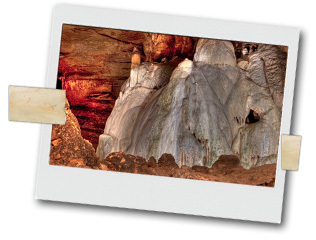 The Seneca Caverns Company offers the Seneca Caverns Tour. It has been open to visitors since 1928. The caverns feature unique geological formations that are visually stunning and wondrous. Guides lead visitors through the tours, pointing out areas of special interest, providing information and answering questions. Tours of Seneca Caverns last approximately one hour, during which time visitors are led along a well lit pathway. The path through the cavern dips to 165 feet below the entrance; cement steps are provided as well as handrails. Over the years, hundreds of thousands of visitors of all ages have made the trip. Many a visitor reminisces about coming to Seneca Caverns as a child and then delights in bringing their own children for the journey.